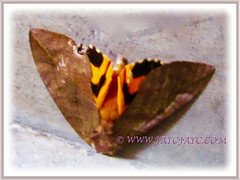 This gorgeous Fruit Piercing Moth visited our home about two days ago in the afternoon. It laid silently outside our grilled gate as if waiting to be awakened from its slumber. We took a couple of photos of this amazing beauty. Is it a butterfly or moth, we wondered? I posted in the Facebook Group of Butterflies in Singapore and Malaysia and was delighted and thankful to get confirmation of its identity from one of the members, Gan Cheong Weei. Eudocima phalonia is a fruit piercing moth. Not a very colourful tropical moth but attractive all the same. 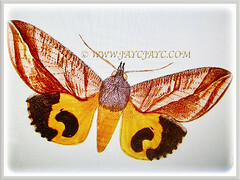 The moth is medium-sized with wingspan about 80–94 mm in male. Palpi with third joint long and spatulate at extremity. Fore wings with non-crenulate cilia in male, crenulate in female. Head and thorax reddish brown with plum-color suffusion. Abdomen orange. Fore wings reddish brown, usually with a greenish tinge and irrorated with dark specks. An oblique antemedial line present, which is generally dark and indistinct but sometimes pale and prominent. Reniform indistinct. A curve postmedial line found, which is almost always met by an oblique streak from apex. Hind wings orange, with a large black lunule beyond lower angle of cell. There is a marginal black band with cilia pale spots runs from costa to vein 2. 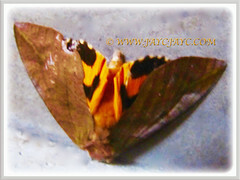 Ventral side of fore wings with orange postmedial band. 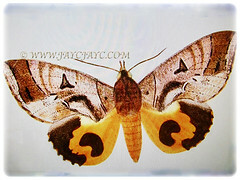 Do check out at https://en.wikipedia.org/wiki/Eudocima_phalonia for in-depth information on Eudocima phalonia and be astounded by photos of this moth. Distribution range: Found in large parts of the tropics, mainly in Asia, Africa and Australia. It is introduced in other areas such as Hawaii, New Zealand and the Society Island. Hostplant(s): The larvae feed mainly on vines belonging to the Menispermaceae but are also known to feed on Erythrina crista-galli, Erythrina fusca and Erythrina variegata.